Despite guidelines on the treatment of acute heart failure (AHF), treatment remains heterogeneous, particularly regarding intravenous (IV) nitrate use. This clinical decision-making study assessed the use of IV nitrates and diuretics by 40 UK hospital physicians, each ‘treating’ the same 10 virtual patients. Semi-structured interviews were performed to investigate participants’ decision-making rationale. IV nitrates were prescribed in 37% of clinical decisions. Considerable variability was seen in the administration of IV nitrates among physicians. Interview data revealed polarised opinions regarding the efficacy of IV nitrates and the evidence base supporting their use. Physicians’ treatment decisions were more heavily influenced by their perceptions and beliefs regarding IV nitrates than by consideration of the evidence. In contrast, diuretics were prescribed more frequently (78%) and more consistently. In conclusion, where there is a limited evidence base and no strong recommendation from clinical guidelines, prescribing behaviour for AHF therapies such as IV nitrates are likely to reflect variability in physicians’ beliefs, experiences, and decision-making styles. The lack of clarity on the optimal treatment approach to AHF is likely to be one of the main reasons for the considerable treatment variability and lack of adherence to published guidelines seen when managing patients with AHF, as compared with chronic heart failure, as reported across many European countries.7-10 The most recent European survey8 across 211 centres in 21 countries reported usage of IV nitrates in around 20% of AHF admissions, including use in 10% of patients with the apparent contraindication of systolic blood pressure below 85 mmHg. In this study, we explore this heterogeneity in treatment approach with respect to the administration of IV nitrates by examining the treatment of the same 10 ‘virtual’ AHF patients by 40 UK physicians. Additionally, in-depth interviews were conducted with the physicians to explore the rationale behind their declared prescribing behaviour. This study was designed to assess and understand the use of IV nitrates and diuretics by cardiologists, emergency medicine physicians, and acute medicine physicians treating AHF. Participants completed a virtual patient (VP) decision-making exercise, and took part in a 60-minute, in-depth, semi-structured telephone interview; all participants gave informed consent. Ethical approval was obtained through an independent research ethics committee. Forty hospital physicians were recruited by purposeful sampling to capture a sample representative of all hospital physicians treating AHF in the UK. Purposeful sampling included: different types of hospital (university/teaching hospital and district general hospital); hospitals in various geographic locations in the UK; experience (years of experience in their specialty); patient caseload; and physician age. Of these 40 physicians, 20 were cardiologists, 15 were emergency medicine physicians and five were acute medicine physicians. Inclusion criteria were: final year specialist registrar or consultant level; working in the specialty for 3–30 years; treating at least 10 cases of AHF per month; and at least 50% of professional time spent in direct patient care. 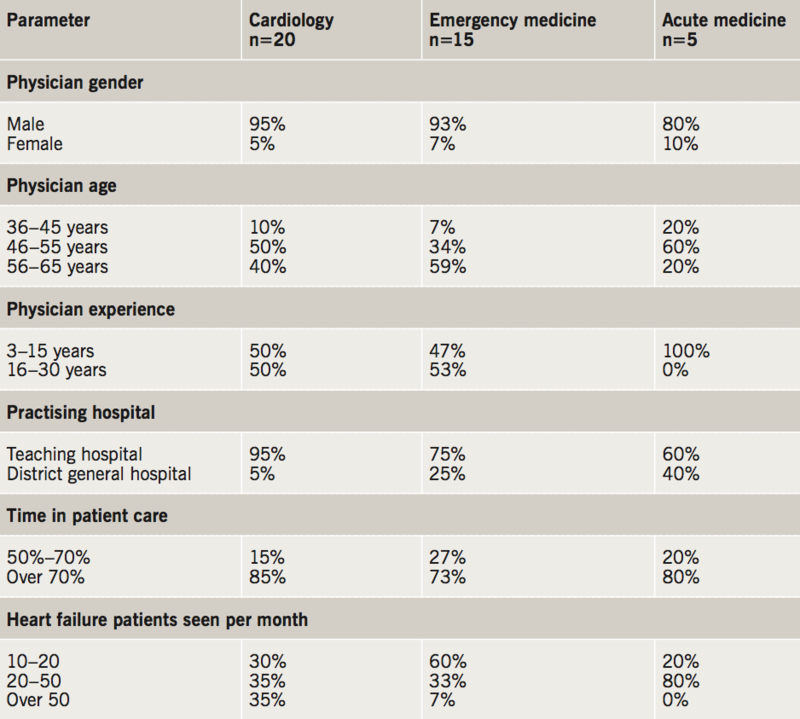 Detailed demographics of physicians are presented in table 1. The prescribing behaviour of physicians with respect to IV nitrates and diuretics was assessed using a VP decision-making exercise. This methodology has been developed from medical education research and social judgement theory,9,10 and has been shown to correlate closely with real-life clinical behaviour.11,12 This method objectively records treatment decisions rather than relying on stated opinions. The VP exercise was sent to participants via email and completed electronically. AHF encompasses a variety of syndromes with different causes and clinical presentations.5 To ensure these were fully represented and tested, the 10 VP cases included in this study were developed in collaboration with cardiologists to represent the full range of patient demographics, relevant past medical history, and clinical characteristics encountered in their populations of patients with AHF. Each of the virtual patients had AHF, either as a de novo presentation or as decompensation in known chronic heart failure. All virtual patients had clinical signs of congestion and systolic blood pressure of 90 mmHg or more. Five of the virtual patients had diastolic blood pressure of 90 mmHg or more. A brief summary of the key characteristics of each of the 10 virtual patients is presented in table 2. Physicians were asked to review each patient and the patient’s clinical data, and indicate what their immediate management would be. Treatment options were comprehensive and unrestricted. Physicians were able to select any relevant drug treatment, oxygen, angioplasty, pacemaker or lifestyle advice and could select multiple treatment options if that reflected what their immediate management would be. Statistical analysis was performed on 400 treatment decisions produced by the VP exercise. Standard descriptive statistics were calculated; for non-normally distributed data, non-parametric statistics were used. Univariate logistic regression analysis was used to identify factors significantly associated with the prescription of nitrates. Dependent variables were: use of IV nitrate and use of IV diuretic. Independent variables included: physician variables (age, gender, specialty, years of experience and type of hospital) and patient variables (demographic, past and presenting condition and investigations/clinical assessments). Significant factors from univariate analysis were then entered in random-effects logistic regression models (separate models for IV nitrates and IV diuretics) to quantify the impact of individual factors. Random-effects models were used to control for the clusters of 10 decisions made by each of the physicians. Data were analysed using SPSS version 22.0. Trained qualitative researchers conducted semi-structured telephone interviews of up to 60 minutes with each physician. Interviews investigated the participant’s views on the general management of AHF, the rationale for treatment decisions, and explored the perceived role of IV nitrates and IV diuretics in AHF management. Interviews were recorded, transcribed verbatim and evaluated using thematic analysis.13 Two trained researchers worked independently to identify and code statements of interest and draw out recurring themes; data were re-examined and results were compared to ensure reliability. IV diuretics were prescribed in the majority (78%) of ‘consultations’ (where the 40 physicians were treating the same 10 VPs), and were used consistently across specialties (figure 1). In contrast, IV nitrates were prescribed in only 37% of ‘consultations’. Table 2 shows the proportion of physicians making decisions to use IV nitrates and IV diuretics by the type of VP. Of the three indications specifically mentioned in the NICE guideline, usage was recommended by the majority of physicians for hypertensive heart disease with preserved ejection fraction (55%), with only 28% recommending usage for post-myocardial infarction heart failure, and 25% for heart failure due to progressive aortic regurgitation. There was no association between the decision to prescribe IV nitrates or IV diuretics and any of the physician demographic factors, such as specialty, level of experience, or heart failure workload. Despite the fact that all physicians treated the same 10 VPs, there was a wide variability in the use of IV nitrates among physicians. This ranged from six physicians not prescribing IV nitrates to any of the patients to one physician prescribing to all 10 (figure 2). IV diuretics were prescribed more consistently, with 90% of physicians administering IV diuretics to between six and 10 patients (figure 2). Random-effects logistic regression analysis demonstrated that the decision to administer IV nitrates was associated with patient factors including diastolic blood pressure ≥90 mmHg on admission (odds ratio [OR] 2.40, p=0.004) and comorbid diabetes mellitus (OR 4.35, p=0.002) (table 3). Patient factors that were not significantly associated with the use of IV nitrates in the univariate analysis (and, therefore, not entered into the multi-variate regression) are listed beneath table 3, and include pulmonary oedema and angina. The very small variability in physicians’ decisions to prescribe IV diuretics was not explained by any patient or clinical factor. Analysis of participant interviews highlighted eight themes related to the administration of IV nitrates for AHF (table 4). Physicians held different perceptions regarding the risks and benefits of nitrate use, and different beliefs regarding their efficacy and potential side effects. Most physicians were aware of NICE or ESC guidelines for AHF, but not all used them in their clinical practice. Eight (20%) physicians said that neither set of guidelines were used in their department. These eight physicians included both ‘high’ users of IV nitrate (physicians who used nitrates in ≥6 VPs) and ‘low’ users of IV nitrate. ‘High’ users of IV nitrate perceived a necessity for treating AHF with a fast-acting agent, had a belief that diuretics alone would be inadequate, and thought IV nitrate superior to diuretics. Getting patients better as quickly as possible was a stated major treatment goal for these physicians, who had low levels of concern around possible side effects, believing that IV nitrate was relatively safe and improved long-term patient outcomes. Additionally, ‘high’ IV nitrate using physicians generally experienced an increased sense of ‘control’ over patient management during administration of IV nitrate due to the possibility for dose titration. In contrast, ‘low’ users of nitrates generally preferred conservative first-line treatment with a diuretic, before progressing to further intervention where necessary. Some ‘low’ users did not consider IV nitrate to confer advantages over diuretics alone, and highlighted the practical barriers to administration. Many expressed a sense of uncertainty associated with IV nitrate use, particularly the need for dose titration, resulting in a reduced sense of control over patient management. Physicians who were high versus low IV nitrate users tended to have different decision-making styles: high users were more intuitive, self-confident decision makers who prioritised speed of effect over potential risk, whereas low users were more methodical, ‘rational’ decision makers, preferring a step-wise approach with assessment of risk and response at each stage. Using virtual patient profiles, we have found that IV nitrates are likely to be used in only the minority of clinical profiles of AHF treated by a group of physicians in the UK, including cardiologists and emergency or acute medicine physicians. We also show marked variation among physicians in which clinical profile would trigger them to prescribe IV nitrates in AHF. This variation was much more marked than was found for the use of IV diuretics. Our findings are in keeping with surveys of the use of IV nitrates in AHF in other European countries in the past decade. IV nitrates were used in the management of 51% of admissions in a three-month period in 2004, in 206 cardiology centres across Italy.14 A survey conducted by the ESC in 2004/2005 across 133 centres in 30 European countries reported usage of IV nitrates in 38% of admissions with AHF – with 71% usage in acute pulmonary oedema but also usage in 36% of patients with cardiogenic shock (where guidelines suggest the vasodilator is contraindicated).15 In the USA, usage appears to be lower than in Europe, with a national registry study at 285 hospitals from January 2002 to December 2004 (159,168 hospitalisations) reporting use of IV nitrates in only 9% of admissions.16 A more recent international study of 776 patients across 18 countries confirmed lower usage of IV nitrates (but higher usage of sublingual nitrates) in the USA compared with Europe.17 This variation in practice presumably reflects the limited evidence base, variation in the value placed upon and interpretation of the published evidence base by different physicians, and the lack of strong recommendations in (international) guidelines. In the absence of a clear evidence base demonstrating superiority of a particular intervention, there will inevitably be differences in interpretation of the literature among physicians. We found a wide range of views regarding the strength of evidence supporting IV nitrate use and the perceived efficacy of such treatment. Many physicians referred to their own experience, beliefs and perceptions as being more important than published guidelines – and, indeed, several stated that the published guidelines were not followed in their department. Interestingly, use of both diuretics and nitrates was influenced by the decision-making style of the physician. High users of IV nitrates tended to be ‘bold’ decision makers, whereas low users tended to have a more conservative, iterative, decision-making style. This study was limited to UK physicians and may not reflect practice or attitudes elsewhere, although variation in practice is reported to be similarly high. We used clinical vignettes (‘virtual patients’) to assess physicians’ likely prescription habits, rather than directly observing this – although this approach has been validated and used in other disease areas.11,12 The sample size of 40 physicians was appropriate for a qualitative study, where the primary objective was to gain a deeper understanding of the role of diuretics and nitrates in the management of AHF and how and why physicians use them. What the study clearly demonstrated was the considerable variability in the use of IV nitrates in AHF. Given such variability in clinical practice, it would be useful to repeat the quantitative clinical decision exercise in a larger sample of physicians to further investigate the clinical determinants of nitrate use. There is a perception of unmet need around AHF – with no new therapies available for several decades.18 Our study suggests that for there to be consensus on the use of a new therapy, the evidence base should be strong (likely to come from an adequately powered randomised-controlled trial or trials), and supported strongly in national and international guidelines. In addition, the ‘style’ of decision making of the physician may influence the perceived value of a new therapy – and its place in the pathway of care. Those physicians who prefer an iterative, empiric decision-making process may respond more positively to a stepped approach to therapy, whereas those with a ‘bolder’ style may be comfortable with adding several therapies simultaneously. A clear recommendation on which population of patients with AHF syndrome should have, or not have, such a new therapy is also likely to be of value to the clinical community. Further research is required, both to improve the evidence base regarding the appropriate treatment for AHF, as well as to better understand the individual factors that influence physician decision-making in the acute care setting. In conclusion, our study confirms wide variation in the usage of IV nitrates in the treatment of AHF, likely related to differing interpretations of the poor-quality evidence base. Our data suggest that variation results from differences in clinical experience, personal perceptions, and physicians’ decision-making styles. Variation also results from differences in patient factors, such as clinical evidence of congestion and the presence of diabetes mellitus. FD is an employee of Novartis. AC is a director of Hamell who received funding from Novartis to design and implement the study, perform the analysis and write the paper in collaboration with MRC. MRC has a consultancy agreement with Hamell related to this project that covered study design and review of the data. MRC’s salary is supported by the National Institute for Health Research Cardiovascular Biomedical Research Unit at the Royal Brompton Hospital, London.